What common fruit machine maintenance goes into keeping gaming machines up and running and in good working order for longer? Open up a typical fruit machine and you’re confronted with a labyrinth of cables, buttons and switches – any one of which could fail if not properly maintained. Regular fruit machine maintenance helps to prevent problems before they arise, with prompt fruit machine repairs to fix anything that’s gone wrong and needs attention. 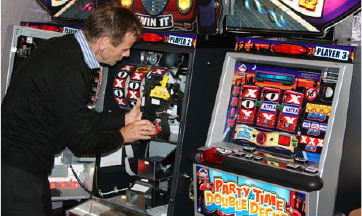 Pub fruit machines can often be altered to accept different stakes and pay out different jackpots – maintenance in this area takes two parts, first updating the software to the new stakes and jackpots, and second switching out the decals that display this information on the front panel to the player. If a light has gone out or a button isn’t working as expected, individual components can be replaced or simply carefully rewired to get them back to full functionality. Fixing a jammed coin slot can be relatively easy – you just open up the machine, extract the coin validator, and give it a clean; regular cleaning is a good idea anyway to prevent obstruction of the slot by foreign objects. At the other end of the coin chute, you need to make sure your gaming machines dispense prizes correctly, and again this is a case of regular cleaning to remove potential obstructions. Finally, pub fruit machines fitted with note validator can improve profitability by allowing players to pay with paper money rather than needing a pocketful of change – fitting one of these can form part of your routine maintenance.